← Focus Groups – U.K. 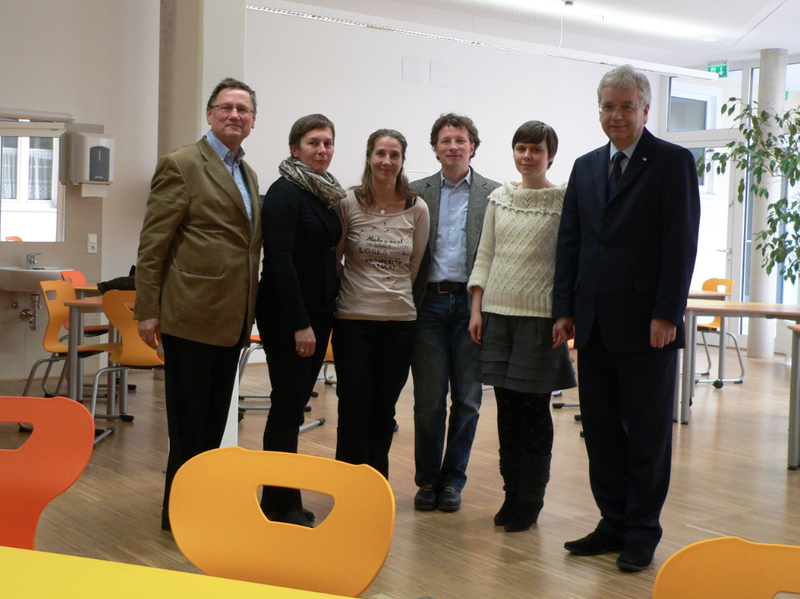 The third and last round of the cycle 2 Focus Group sessions around Europe was facilitated at an all girls school, the Ausbildungszentrum St. Josef in Salzburg, Austria on Monday. The session was held in German. 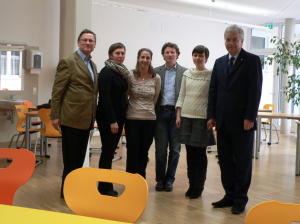 The school is part of the European Network of Innovative Schools (ENIS) in Austria. Students of St. Josef recently designed an illustrative multilingual brochure for doctors and patients that presents essential phrases used in situations related to patient admission, symptoms, drugs and pharmacy etc. in German, English, Turkish and Croatian. The brochure was distributed in pharmacies and hospitals in and around Salzburg. It represents an inspiring example of online collaboration between students and experts to address societal challenges with hands-on activities. Six engaged 15 to 16 year old girls participated in the session. 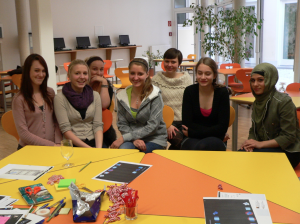 Previous to the Focus Group session, the girls visited the Interpredagogika, an e-learning conference in Vienna, where they communicated with a Finnish classroom virtually about the brochure design. Hence, the students were able to draw on their experiences when we spoke about the prototypes TeamUp, ReFlex, Sessions and Ambire. The students mentioned that the technology often fails to work for them. 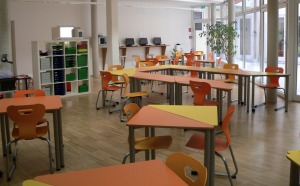 So, although they liked the idea of TeamUp and ReFlex, they said “if the netbooks don’t work properly then it is more work than fun really.” Generally they would prefer to be able to choose to make a recording available for the teacher or not. The students mentioned different learning types (audio, visual and haptic), which they felt the interface is not supporting. For example, “in this interface you cannot see what we did, you can only hear it. It would be good to choose to record and to add a short note as well.” None the less, the students said that the personal audio recordings of ReFlex would add to their team work experience, because “in team work, there are sometimes different opinions, but in the team work we have to come to one outcome.” Through ReFlex opposing opinions could be recorded, shared and discussed. The Sessions concept of easily connecting to classrooms of other countries was well perceived by the students. 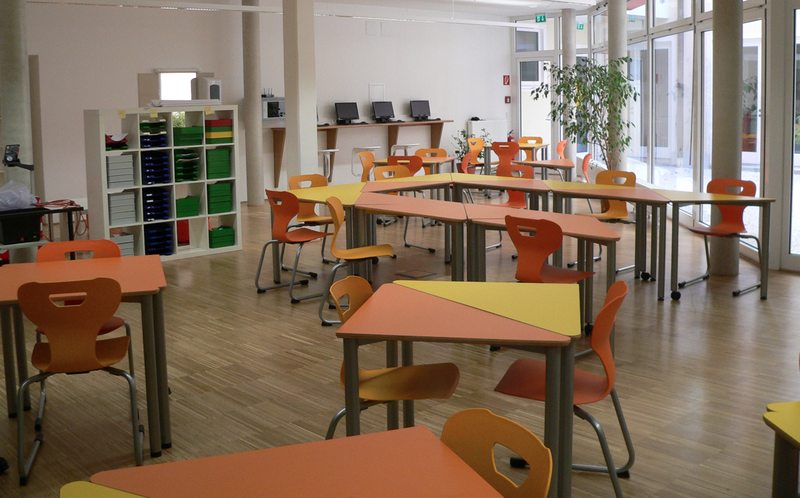 However, the ambient rotating classroom concept of Ambire was considered problematic. The students ideated the scenario of someone finishing a task early and starting to browse the Internet for cute cats. This might send a wrong message to others, including the teacher. Three female teachers (Healthcare, English and Geography), a member of the technical staff, the school principle and a member of the European Network of Innovative Schools (ENIS) Austria participated in the teacher Focus Group Session. During this session, the prototypes TeamUp, ReFlex, Sessions and Ambire were discussed. The teachers said that this school is very keen on teamwork. Usually, teams are formed by the students and the teacher learns about the team formation only at the end of the project. Hence, the visualization of the team formations was considered useful. The TeamUp icons were perceived as delicate, especially when students can see this. Overall, the audio recording of team reflections was perceived as the stronger feature of the tool. For individual recordings using ReFlex, the teachers felt that the students should be able to choose which recordings to share with the teacher. None the less the teachers wanted to see how many recordings were created by each student. They wanted to use the recordings to see how they compare their observations during class. “And the individual recordings are for the students themselves helpful, because it might happen that I work in a team and my individual learning results and my problems might be completely different to those of the rest of the group.” Limiting the recording to 1 minute was considered to be positive, not only because it limits the time the teacher has to spend catching up on the work that was done. For students to learn how to summarize their ideas and present them concisely is quite important. This entry was posted in News and tagged austria, focus group. Bookmark the permalink.